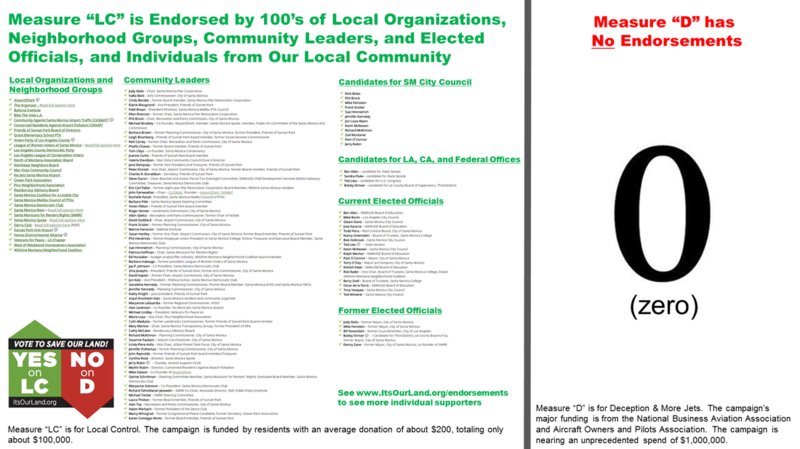 We're a network of people and organizations from Santa Monica and the adjacent Westside of Los Angeles advocating the end of airport pollution, noise, and dangers and a fast transition of our public airport land to parks and community spaces for everyone to enjoy. Community organization is a team effort. It requires the participation of many because no one person or organization can do it alone. Our network of residents and organizations are committed to the better future use of our land and together we are working collaboratively to achieve our vision and goals. See our GeoSpatial Distribution and the airport impact zone on a map. See our August 2016 letter to Santa Monica City Council regarding interim actions prior to closure. These groups and organizations are part of our network and we span across Santa Monica and the Westside of Los Angeles (see GeoSpatial Distribution). In addition, below are a number of local organizations that support the plans for a park and open space. Click here to print your own No Jets sign.